Just a quick post to wish all my readers - regular, occasional and one-off - a Happy New Year! For various reasons (which I won’t bore you with here) I haven’t been blogging much over the past couple of months. Unfortunately the winter arrived before I found time to do the final leg of my trip (Stage 7), so that will have to wait until the spring. On top of that, I still have to write up the last couple of days of Stage 6, which I rode in late September, so I can’t even write a review of 2011 yet. Not to worry. I promise to return - refreshed and re-energised - in the new year. 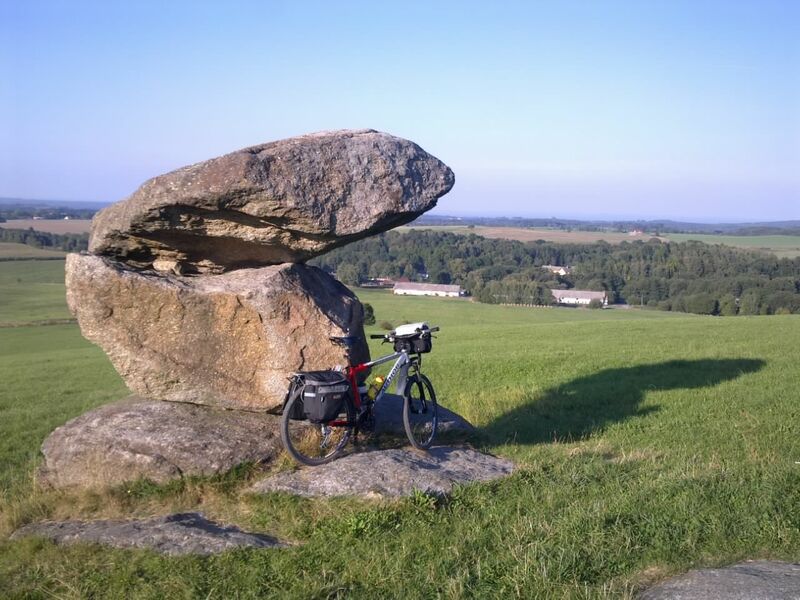 Some days not much happens when you’re bicycle touring. Take today, for example. 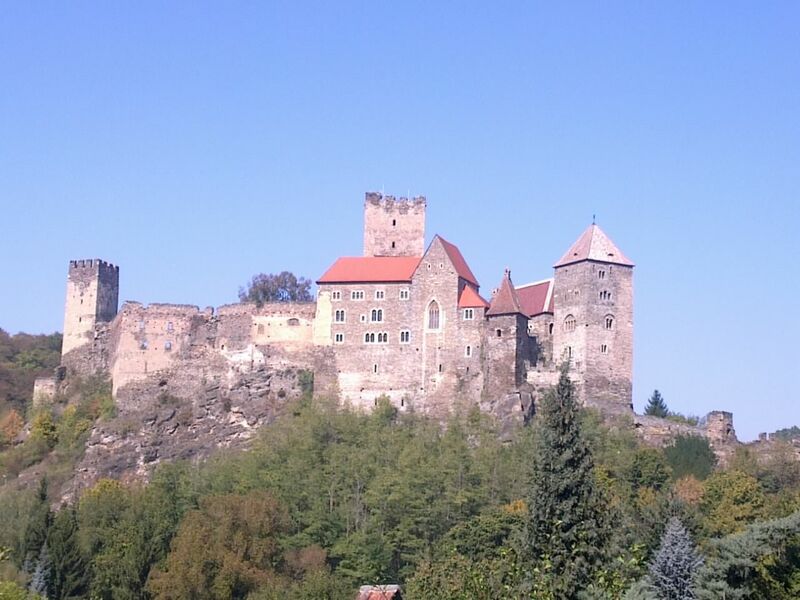 I’m in the Nové Hrady Mountains, a lesser known region deep in the south of Bohemia. It consists mostly of unpopulated forest and there are few tourist attractions to lure people in. But while there might not be much going on here, there’s more than enough to satisfy the senses: the sickly sweet scent of pine resin oozing from log piles at the side of the trail, the ever-shifting dapple of the auburn autumn sunlight on the ground below me, the cool crisp air roaring across my ears as I coast downhill. Yes, today may be uneventful, but it is - literally - sensational. I've been busy over the last few days putting together a slideshow of Stage 6, which I completed last week. 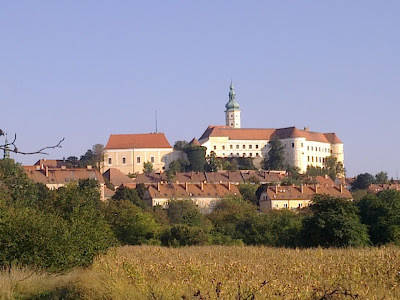 I hope you like the results - Southern Moravia looks particularly pretty in the autumn sunshine. Click on the panel above to see the full-sized version with commentary. 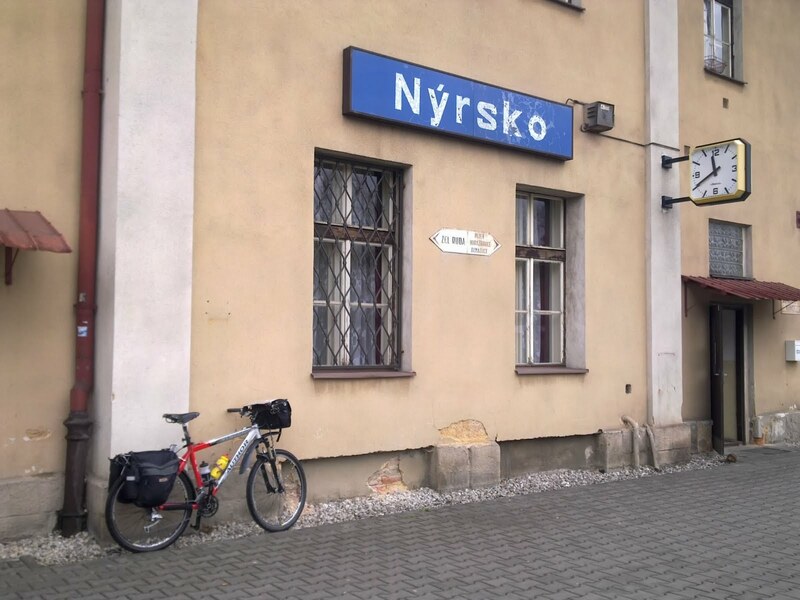 Just a half day’s cycling in store for me today, on the back of a four-hour train ride from Prague to the start point of Stage 5 - Nýrsko on the northern edge of Šumava National Park. 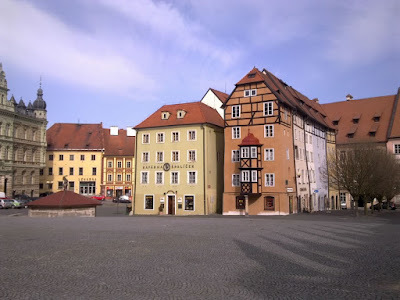 I begin by retracing a small section of the Prague-Munich ride I did with a couple of friends three years ago. Back then, the weather was cold and wet. The steam rose from our backs as we laboured up the climb to Špičák pass, and the subsequent descent chilled us to the bone. In Železná Ruda we took refuge in a pub to warm up, but the manager switched the heating off as soon as we arrived. It’s none too warm today, either, and for reasons not even known to myself I’ve booked a room at the same place tonight. It doesn’t bode well. Here's the Stage 5 slideshow, folks! The church clock on Horni Dvoriste square is striking noon as I enjoy a celebratory pint and an ice cream outside the village pub. It seems as good a way as any to celebrate the end of Stage 5 before catching the train home. 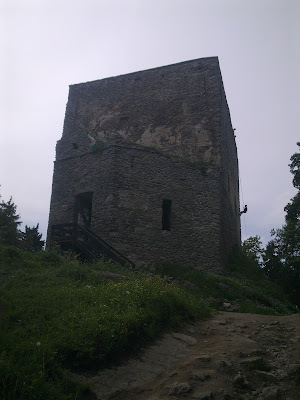 This afternoon I climbed to the highest castle in the Czech Republic - Vitkuv Hradek. Look closely at the photo and you might see a rock climber hanging off the keep. 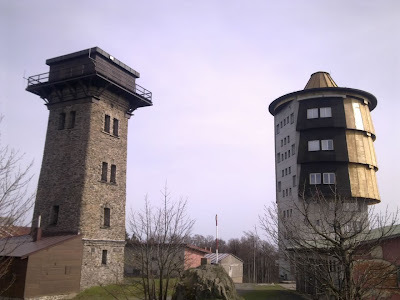 From the top of the castle there are fine views through 360 across Sumava, and especially of Lipno reservoir, aka the South Bohemian sea. 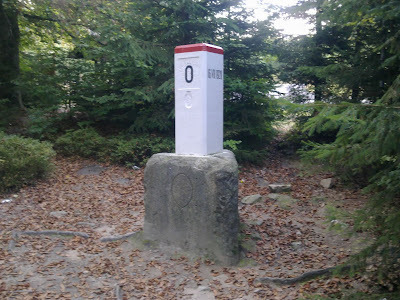 Tomorrow I plan to visit the southernmost point of the Czech Republic, but given my previous failures to find the most northerly and westerly points I'm not feeling too optimistic. Saturday lunchtime and I'm eating blueberry tart in a sunny pub garden. 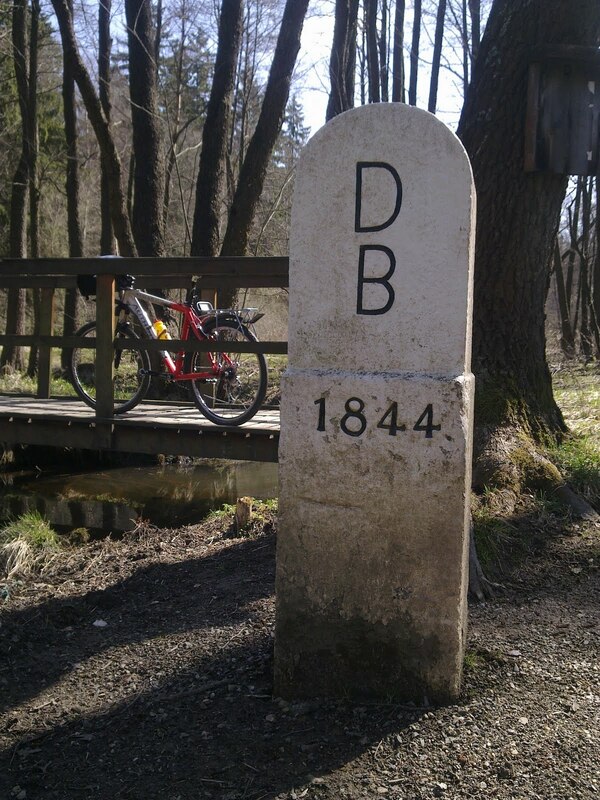 After yesterday's hard work I'm easy riding today down the Schwarzenberg channel, which in past centuries was used to float timber out of the Sumava forest towards Vienna. What a wonderful day on the bike today, despite some 4,500 ft of vertical ascent in all (including to the summit of Polednik, pictured). 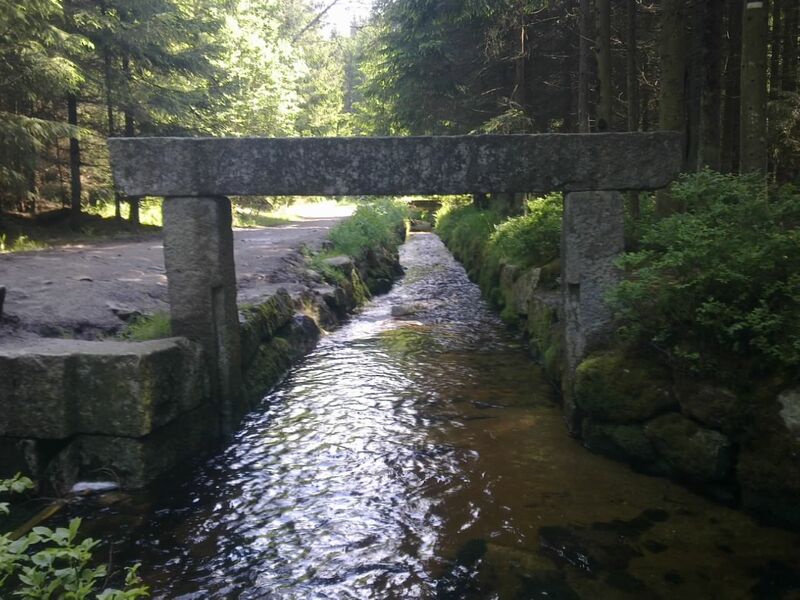 Sumava is wondrously beautiful at every turn. Even the weather, despite some ominous clouds here and there, held fair for me. Shame that Strazny, where I'm spending the night, is such a hole, but one can't have it all. Tomorrow will be much flatter, but there'll be a lot of miles to cover. Today is an in-between day - a transition stage, you might say. 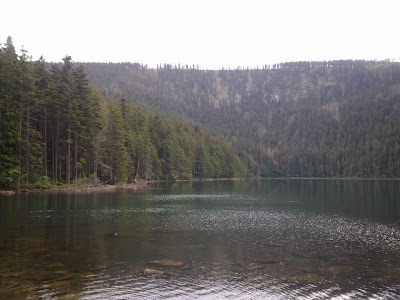 I’m leaving the Bohemian Forest, but I won’t quite reach Šumava National Park further to the south. I’m not travelling far either, only as far as Nýrsko railway station a couple of hours away. A good thing, too, as the weather has broken. The cursed rain that blighted the first stage of my circuit ride last year has returned in earnest. I was woken up in the early hours of Tuesday by a chill wind gusting through the open window of my hotel room. A cold front had arrived. 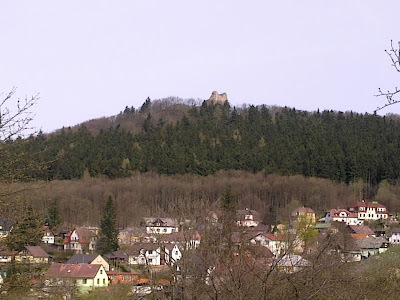 By the time I got up a couple of hours later, the clouds were lying low over Čerchov mountain, where I’d been the day before. It was a stark contrast to the glorious sunshine of the previous three days. 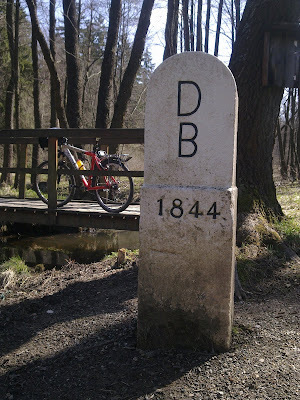 After breakfast I cycled out of Babylon along a tranquil woodland trail then joined the road heading west. The weather held steady to begin with, but before long a drizzle turned into a downpour and I had to pull up and put on my raingear. Before setting off, I’d had an uneasy feeling about Stage 4 of my trek along the Czech border. Now, as the gloom descended, the wind whipped up and the rain came teeming down, I realised why. Cycling along those long lonely stretches of the former Iron Curtain would have been a miserable experience had the weather been like this the whole weekend. It didn’t matter too much now though, as I’d soon be heading home in a warm dry train. I took shelter from the storm on a pub veranda in Velruby. I consulted my damp maps and decided to make straight for Nýrsko along the main road rather than take the more scenic route closer to the border. After a while the rain eased off a bit, so I set off again. A stiff north-westerly wind carried me at startling speed towards my destination, sometimes even threatening to sweep me off the road entirely. On the outskirts of Nýrsko I checked the time and discovered I might just make an earlier train home. After a mad dash through the town, and at least one wrong turn, I arrived in a bedraggled state at the station with less than five minutes to spare. My journey home was complicated, involving four different trains, one bus, one van and one missed connection, but I arrived back in Prague in time for tea. God I love the mountains. This hill is steep - granny-gear steep, lung-burstingly steep, as steep as anything I’ve encountered since Poland last year. But I don’t care. However much it hurts, it's still more fun than staring at a computer screen at work. The day I’m no longer physically capable of doing this will be a sad day indeed. I feel lucky - so lucky - to be here. I round a corner and the twin towers of Čerchov suddenly come into view through a gap in the trees. I descend briefly, then hit the final ramp to the summit. I’m standing at the base of Milíře, a steel telecom tower built in 2001. I’m feeling pretty exhausted after a long day in the saddle, so it takes me quite a while to persuade myself to tackle the 126 steps up to the viewing platform. As I ascend, my cycling shoes beat a slow percussive rhythm on the metal grill steps. The sound contrasts eerily with the plaintive moaning of the wind rushing through the girders around me. My cycling muscles complain painfully about this unfamiliar form of exercise, but I keep going to the top, where I can feel the whole structure swaying in the breeze. Some 80 feet below me, the long shadow of the tower on the field points east towards my destination for the day - the town of Přimda. I’m on the shuttle train from Cheb to Aš, the same train that I took in the opposite direction more than six months earlier at the end of Stage 3. I should be raring to go after such a long winter break, but I’m not. I might be physically prepared, but I’m not feeling mentally ready to resume my circuit ride of the Czech Republic. 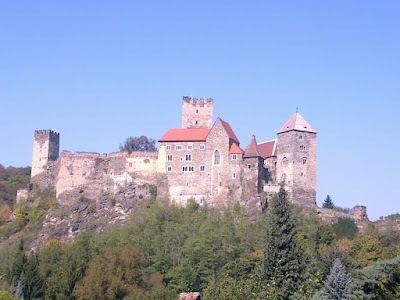 On top of that, my unease about spending three days alone on the Iron Curtain Trail is resurging. Still, at least the sun is shining. Here's the slideshow for Stage 4 of my trip. Click on the photos to enlarge them and view the accompanying captions. I'll be posting full write-ups of the stage just as soon as time allows. Left Přimda (above) this morning and headed straight down into the depths of the deserted frontier forest. This area is littered with sparse remains of old villages, their ethnic German inhabitants having been thrown out of the country after WWII. Ahead of me now is a 1600 ft climb to the top of Mt Cherchov and an equally long descent to Babylon. Today was tougher than I'd expected. I left Cheb (above) at 10 am and didn't arrive in Přimda until 6.30 this evening. 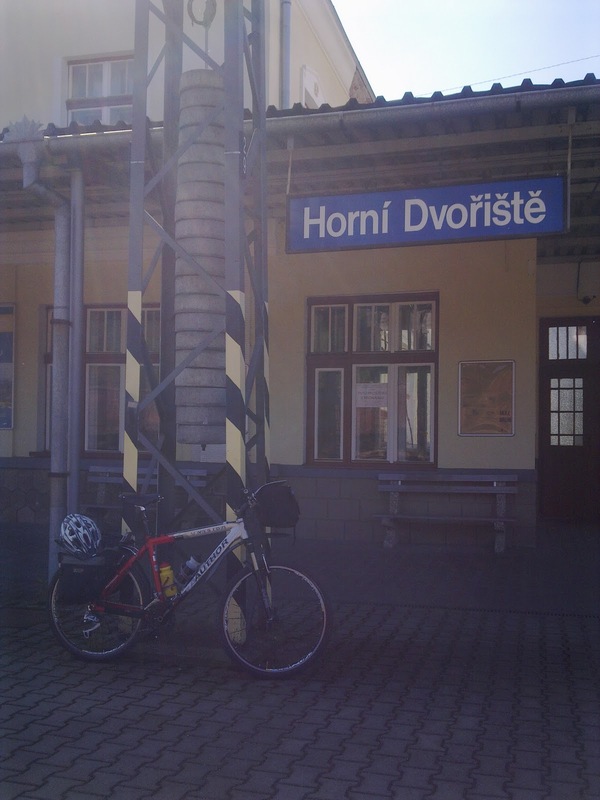 90 km along the switchback Iron Curtain Trail was more than enough for one day. However, I've now passed the halfway point of my circuit ride of the Czech Republic, so I'm feeling suitably pleased with myself. It’s been all quiet on the blog in March, but I haven’t been idle. First of all, I’ve been training pretty hard - both on and off the bike - to get back into shape for the remaining four stages of my cycling circumnavigation of the Czech Republic, all of which I intend to complete this year. For the first time in my life, I have something approaching a physique. I’ve also been giving my mountain bike (my machine of choice for the remainder of the trip) a bit of TLC after the battering it suffered last year. All that mud and rain put paid to the bottom bracket, so I got my local bike shop to replace that and to service the front forks, a process which, for reasons unknown, took them a week and a half. All the rest I’ve done myself: I’ve given it a deep clean and lube, installed shiny new wheels (a Christmas present) and replaced the brake pads. All that remains is to change the brake and gear cables and I’m ready for the off. I’ve also been busy planning my annual summer cycling tour with my friends Ryan and Ciaran. Last year we cycled from Munich through the Alps into Italy on the Via Claudia Augusta. This year we’ll be taking up where we left off in Trento and continuing south towards Florence, mostly on the alluringly named Cycle Route of the Sun (Ciclopista del Sole) - but more of that in a later post. Speaking of the sun, I’m currently in the market for some new summer cycle clothing. (In a triumph of hope over experience, I’m planning for sizzling weather this year.) I’ve given up on Czech bike retailers owing to a dearth of choice, especially in sizes that fit my lanky frame. Instead I intend to buy from Wiggle in the UK. I’m always reluctant to purchase clothes online, but the detailed sizing charts and flexible returns policy at Wiggle take most of the uncertainty out of the process. On top of that they deliver free to the Czech Republic on orders over £100. So what’s next? Stage 4, that’s what. And it might come sooner than you think. Spring has definitely arrived here in Prague and I’m keeping a close eye on the weather forecast. As soon as a suitably warm and sunny weekend comes up I’ll be on the road again. And then, rest assured, the blog posts will start coming thick and fast. The Central European winter drags on for months, and to a cyclist on a mission to cycle around the Czech border it can seem never-ending. But now, on the last day of February, I can finally see the end in sight. The sun was out in Prague this weekend, and for the first time this year I could feel some heat from it. Soon, I hope, the daffodils - and the hemlines - will be rising. As an Englishman I’m accustomed to long autumns and long springs. Here in the Czech Republic, though, the transitions are abrupt. The heat is switched off usually sometime in November and back on again in April. I call it binary weather. The winter does have some advantages, I suppose. 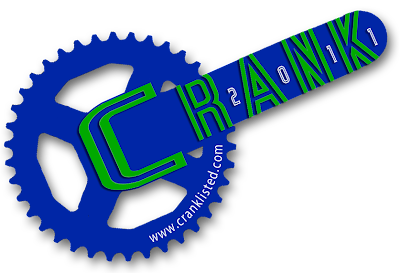 It has given me time to plan my route and to clean up and service my bikes for the season ahead. But it’s not easy being a bike blogger in these parts at this time of year. I simply don’t have much to write about, as I’m not doing much cycling. It’s not the cold that’s the problem - I have the clothing to keep me warm(ish) on the bike even when the temperature is below freezing. It’s the slippery surfaces that thwart me. This winter has been particularly bad in that regard. The snow has been lying on the ground so long it has gradually metamorphosed into sheet ice. As my fellow Prague bike blogger Grant found to his cost last month, it’s not a good surface to cycle on. Now, I’m glad to say, it’s thawing fast. One thing I do try to do in the winter is stay fit. I’ve learned the hard way that doing no exercise only leads to agony when I get back on the bike in the spring. My love-hate relationship with spinning continues. And, for the first time ever, I’ve been doing strength training, inspired by some helpful advice posted on the Loving the Bike blog. It’s all good exercise, but it’s no substitute - physically or psychologically - for cycling. 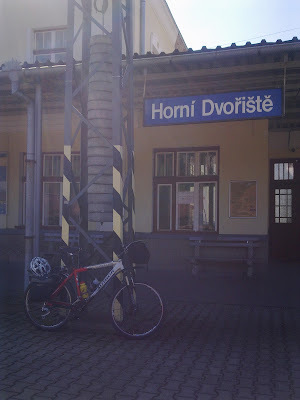 The next stage of my circumnavigation of the Czech Republic runs from Aš down to Nýrsko in the west of the country. It’s mostly fairly low-lying, so I’m hoping to be able to cycle it in April. That should give me plenty of time to complete the three remaining stages before next winter sets in. I just hope the summer is not such a wash-out as it was last year. Stage 7 will be the last leg of my jaunt around the Czech Republic, the one that takes me back to Bohumín, where I started my journey in May 2010. It’s another long stage across some arduous terrain. Day 1, however, should be relatively easy, taking me over the low-lying flatlands of southern Moravia, past the tripoint with Slovakia and Austria, and into the foothills of the Western Carpathians. Then things get seriously hilly as I negotiate the series of mountain ranges running along the Czech-Slovak border (the White Carpathians, the Javorníky and the Beskids). 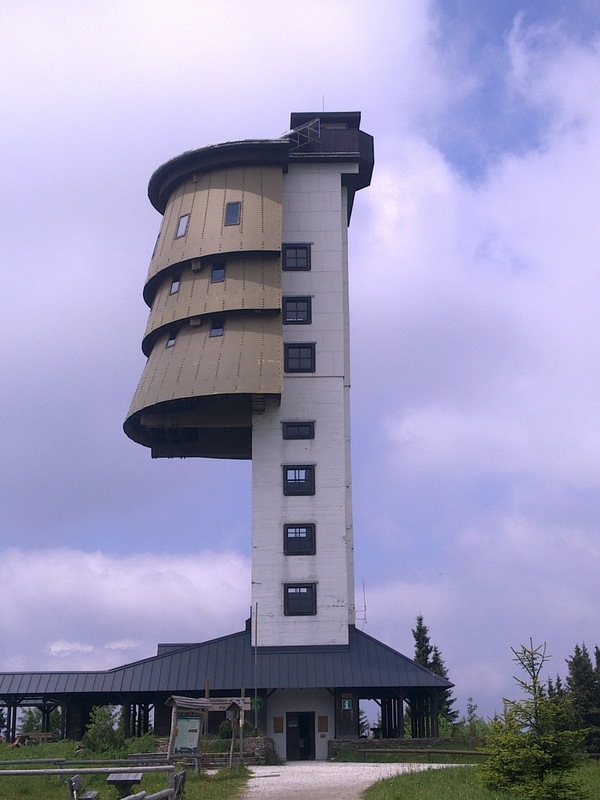 The highest point on the stage will be Čartak viewing tower at 950 m above sea level. From there I’ll enter Slovakia and head further east until I reach the Czech-Slovak-Polish tripoint near Hrčava. 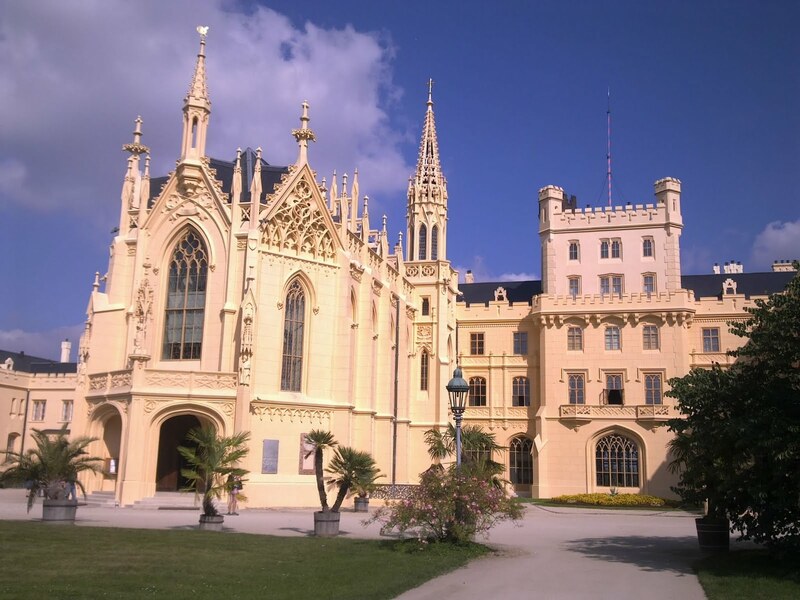 Then I’ll turn north and descend into the historical Polish town of Cieszyn, the final overnight stop of my trip. The last section is a short, flat run around the back of the city of Ostrava to Bohumín railway station. 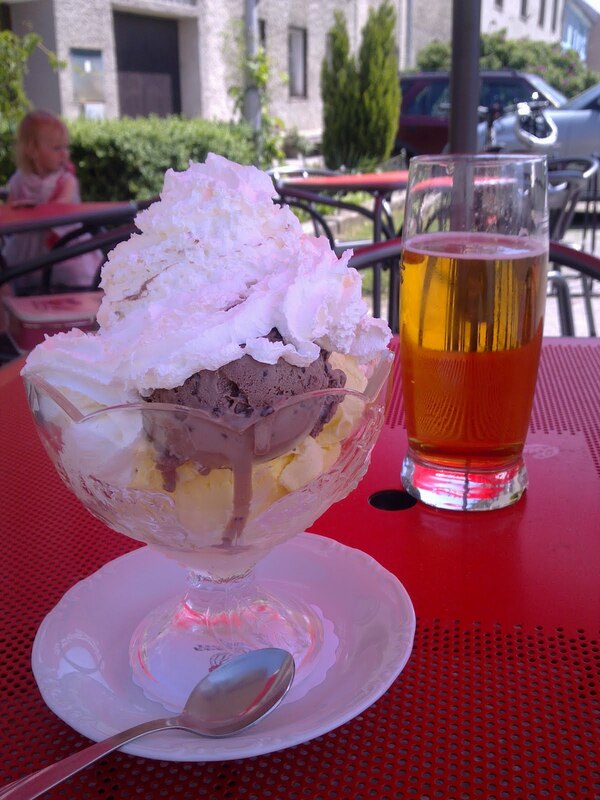 As you can see from the photo, I’m busy planning the remaining four stages of my circuit ride. In doing so, I have discovered - to my surprise - that I am almost halfway around the route already. Last year I rode the northern border of the Czech Republic in three stages, from Bohumín in the east to Aš in the west, covering 1,067 km in the process. All that remains for me now is to cycle back to Bohumín along the southern frontier. And my back-of-the-envelope calculations indicate this is only about 200 km further than I travelled last year. Which brings me to the surprise announcement I mentioned at the end of my previous post - Circuit Rider’s review of the year: I have decided to try to complete all four remaining stages of my trip this year. My original plan had been to leave Stage 7 until 2012, but I admit it never made much sense to leave things hanging over another long winter. 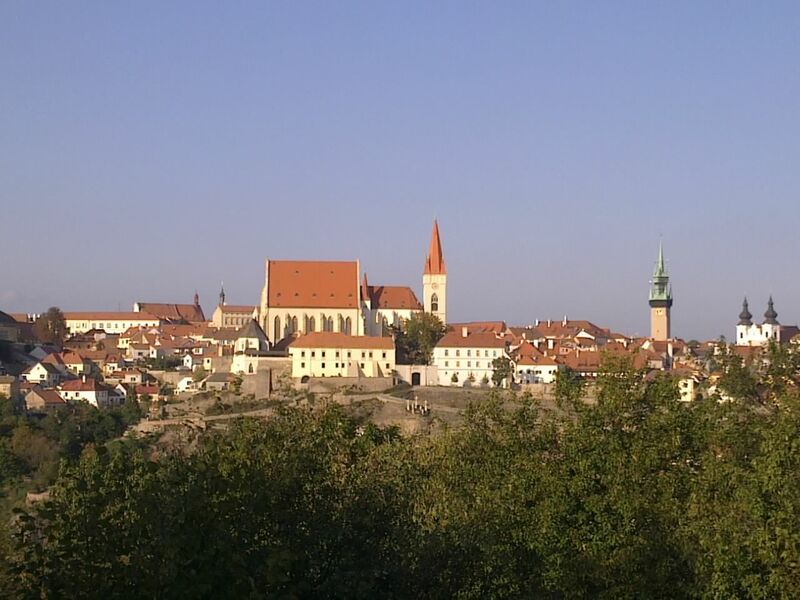 So, if all goes well I’ll have completed my cycling circumnavigation of the Czech Republic by the end of 2011. I’ll be rolling out my route plans for the remaining stages in the course of this month. However, I can already reveal that along the way I’ll be dropping in on all four countries neighbouring the Czech Republic (Germany, Austria, Slovakia and Poland) as well as visiting the westernmost, southernmost and easternmost points of the Czech Republic. Bring it on!